When Ernest Eldridge lined up his latest racing car at Arpajon in France one July morning in 1924 for a record attempt, it was hardly surprising that one of the bystanders' first association was with Mephistopheles; the demon with whom Goethe's Faust wagered his soul with the devil. Finished in a sinister black livery, the fire-spitting beast of a car was indeed a terrifying sight. The nick-name stuck and like Mephistopheles himself the massive Fiat special became stuff of legends. Eldridge's behemoth was based on the remains of a Fiat Grand Prix car of 1908 vintage that was originally used by Italian racing legend Felipe Nazzaro. By 1922 the car was campaigned by Englishman John Duff at Brooklands until its straight four engine, literally, exploded. With an eye on replacing his already very brutal 20-litre Maybach engined 1907 Isotta, Eldridge acquired the remains of the Fiat for a measly 25 Pounds. The successful money-lender had no intention of repairing the 'four' as he had already gotten his hands on a 21.7 litre Fiat aero engine. Originally designed for use on a WWI bomber, the new engine was as sophisticated as it was big. Consisting of three sets of two cylinders, it featured a single overhead camshaft and four valves per cylinder. Along with his loyal engineer and very brave co-driver, John Ames, Eldridge made some modifications to the engine before installing it into the newly obtained chassis. Four Solex carburettors were fitted and two additional plugs were added to the each of the cylinders, bringing the engine's total to 24. 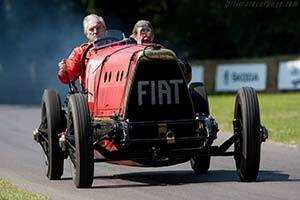 In this guise, the Fiat aero engine pumped out a hefty 320 bhp at just 1800 rpm. In order for the engine to fit, Eldridge had to stretch the Grand Prix chassis by 40 cm (16 inch). A suitable fly-wheel was found on a scrapyard while the 65-plate clutch was built from scratch. As had been the norm back in 1908, the power was transferred to the rear wheels through chains on either side of the chassis rails. Preliminary designed to go fast, brakes were only fitted to the rear wheels. In its early guise, the car featured a very simple body with fully exposed bucket-seats for Eldridge and Ames. A full body complete with belly pan was fitted by the time the Fiat lined up at Arpajon.